On Saturday, the glitz and glam of the annual Nobel Prize ceremony and banquet will arrive in Stockholm. 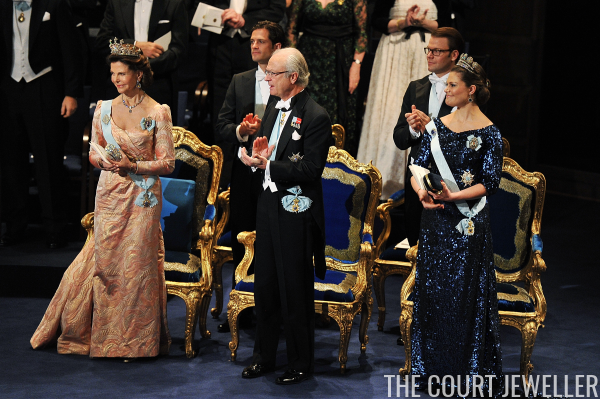 To help get us in the mood for more Swedish tiaras, here's a flashback to the jewels we saw at the Nobels five years ago. 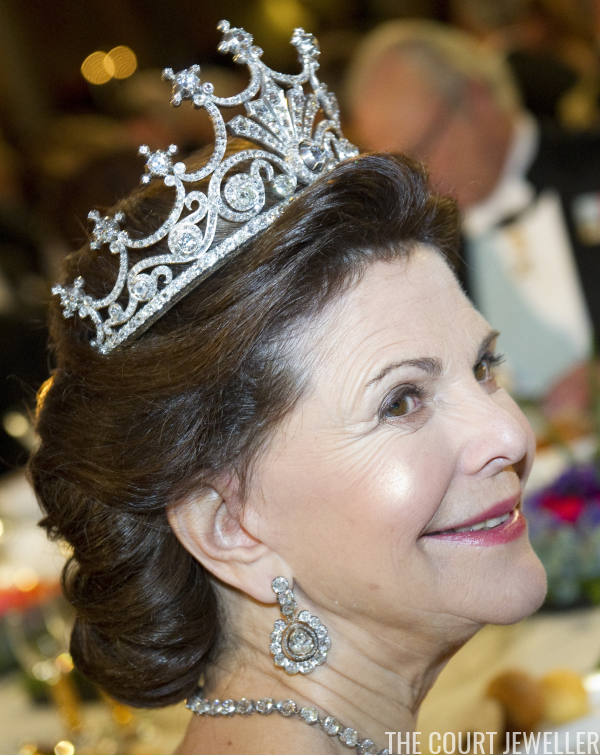 Queen Silvia wore one of her usual Nobel tiaras: Queen Sofia's Tiara (aka the Nine Prong Tiara). This angle shows the unusual setting of the central diamond. We also get a good look here at the Karl Johan Diamond Earrings. 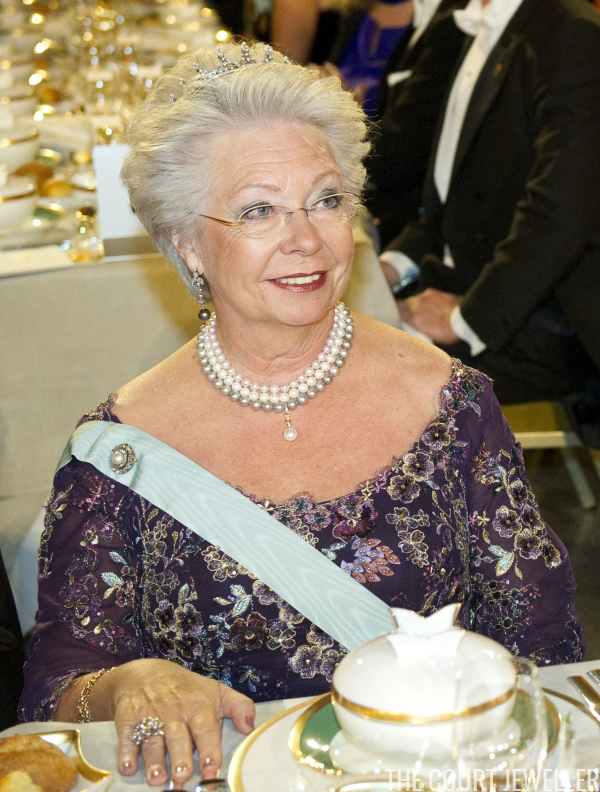 With La Pronger, Silvia also wore a diamond riviere with a pear-shaped diamond pendant. She secured her Seraphim sash with Queen Victoria's diamond lozenge brooch. Here's a look at her apricot and gold brocade gown, which has a very queenly train. 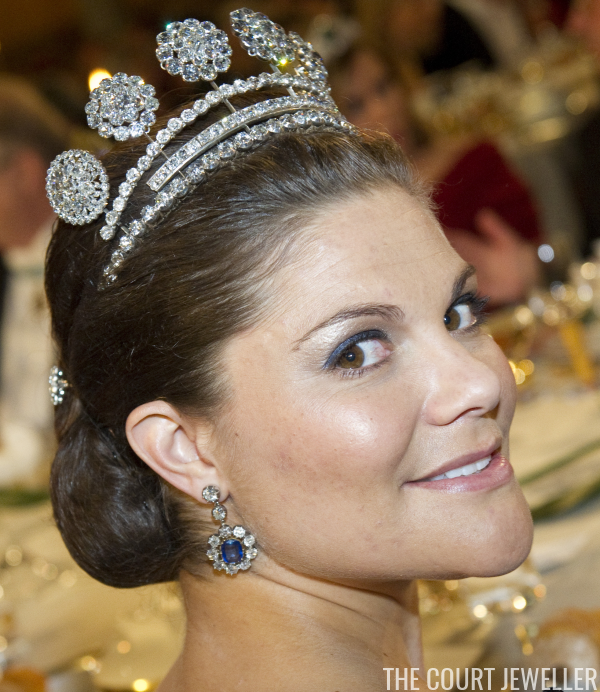 Crown Princess Victoria was expecting Princess Estelle on this Nobel night, but she still piled on the diamonds. She's wearing the Six-Button Tiara in all its glory. As her dress was spangled with royal blue sequins, she also wore pieces from the Leuchtenberg sapphire parure; we get a good look at the earrings here. You can also see that she has jeweled hairpins in her updo. Here you can see that she fastened her Seraphim sash with one of the magnificent Leuchtenberg sapphire brooches. And here's a look at her gown. You'd think head-to-toe sequins could be a bit much, but I absolutely love this dress. 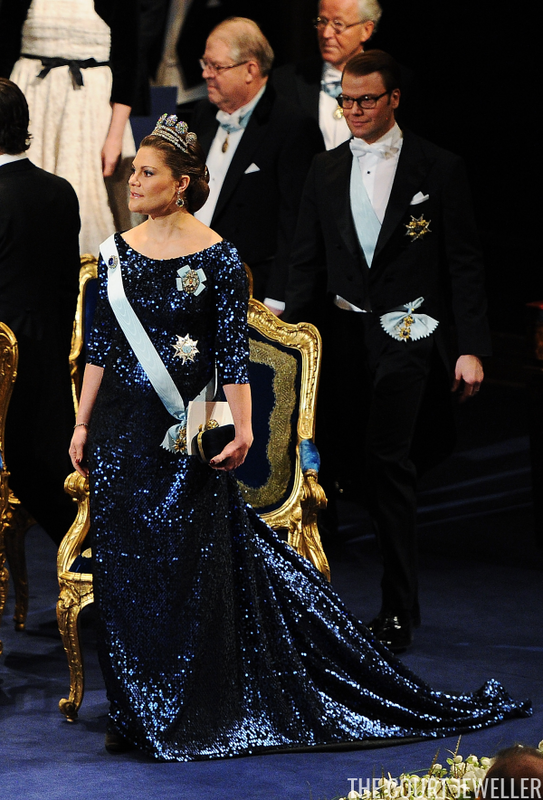 Princess Madeleine didn't attend the Nobels in 2011, but the king's sister, Princess Christina, did. This was one of the last public outings for her small diamond and pearl tiara, which was stolen the following year. She also wore gray pearl earrings, a small diamond and pearl cluster brooch, and a lovely multi-colored pearl necklace. I'm very intrigued by the cocktail ring on her right hand! 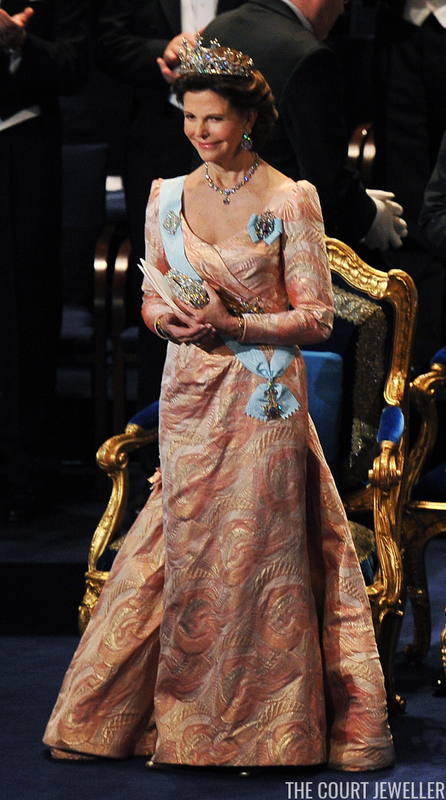 We did get one extra, surprise guest at the 2011 Nobels: Grand Duchess Maria Teresa of Luxembourg. 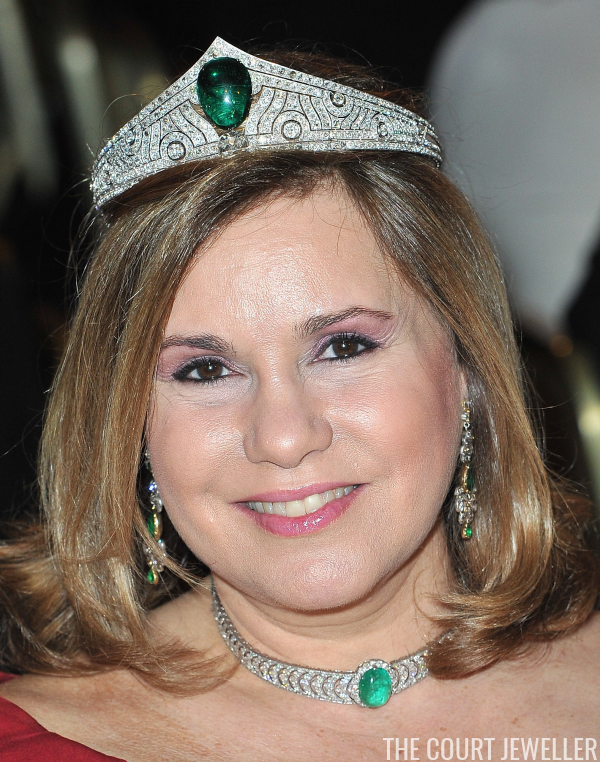 She wore pieces from the family's collection of diamond and emerald jewels, including the Chaumet Emerald Tiara and the diamond and emerald choker. Her earrings are also set with diamonds and emeralds. Maria Teresa didn't sit on the stage at the ceremony, so this is the best view we have of her dress, which I think has a gorgeous neckline. 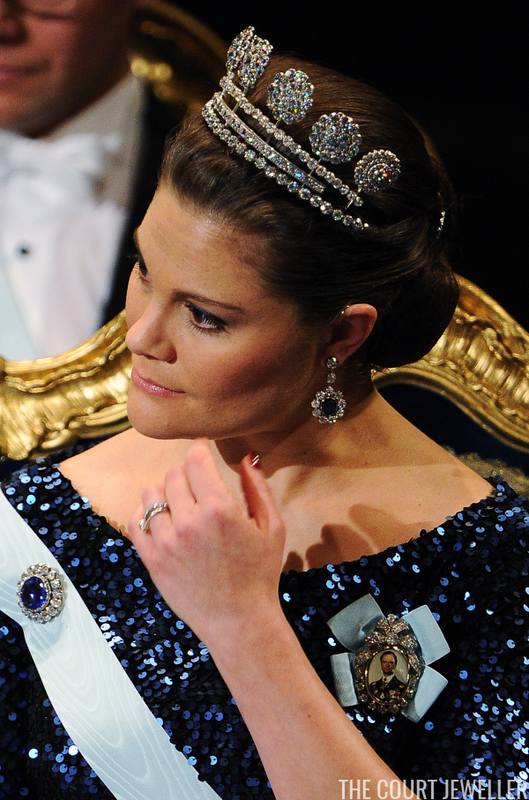 What jewels do you hope to see at this Saturday's Nobel ceremony? 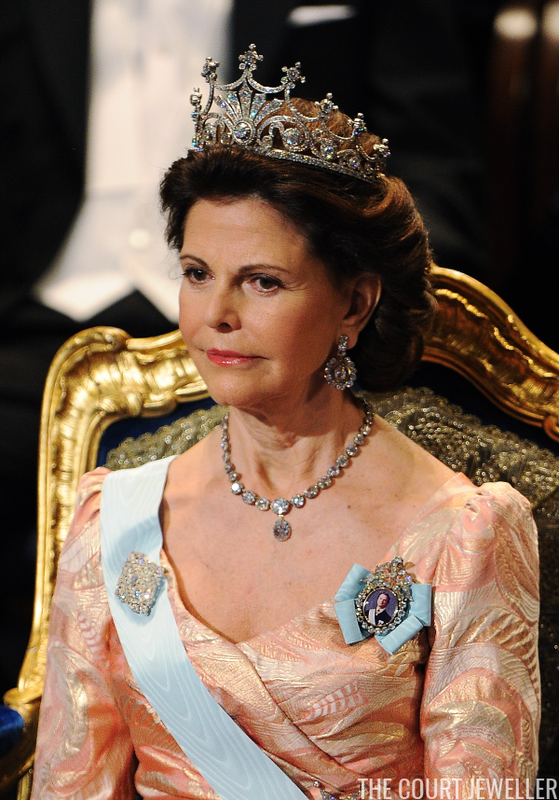 Queen Silvia, Crown Princess Victoria, Princess Madeleine, and Princess Sofia will be in attendance.